Everything you need to break a wild free-range microphone and secure it to the wall, stand, or convenient edge of your choice. Includes (2) QRTT tips. Available with black or purple finish. Aluminum mounting bracket for Zaxcom wireless receivers. Aluminum mounting bracket for Zaxcom RX200 wireless receiver. Hot shoe mount for mounting the SBOX-1N on a camera. Holds a boom pole in a universal grip knuckle on a C-stand. Comfortable foam-covered graphite grip with threaded 3/8" base for attaching to a boom pole or stand. For mounting multiple accessories on a camera shoe. Silicone universal mount for connecting transmitter, monitors, mobile devices, or remotes to a boom pole, tripod, handgrip or other tube shaped object. Folding stand for the RF-Vue analyzer and tablet computer. 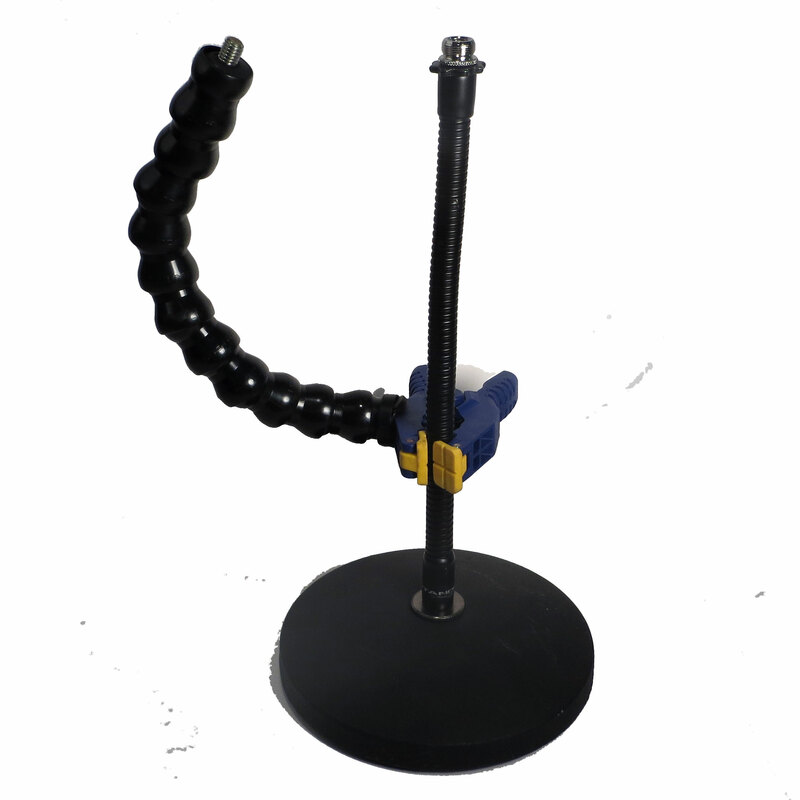 Angling microphone stand mount for the RF-Vue analyzer and tablet computer. For mounting LR or M2R receivers on DSLR-type cameras. Adapts light stand tip to 3/8" male thread. Small clamp for use with tripods, lights, shelves, and bars. Grip/gobo head commonly used on light stands. Available in nickel and black. Clamp for gripping boom poles, tripod legs, stands, or other round objects. Mounts antennae, LCD screens, LED lights and other accessories onto bags and carts. Mount a monitoring screen or mobile device to your Orca bag or ORCart. Water bladder for use with Orca OR-81 Sand Bag. Mount any standard size boom pole on a C-stand. Mounts any accessory with a female 1/4" thread onto a camera hot shoe. Fits camera-mounted female hot shoe extensions. Fits 3/8" thread for either handheld use or extension. For quickly changing out microphone mounts. Available with or without (2) 3/8-16 QR-TIP adapters. Lightweight aluminum camera bracket for Tentacle Sync E with 1/4" screw attachment. Also available with quick release or cold show mount. Articulated arm for the :pulse and :wave time code generators. Tall, highly stable stand with three-section shaft and Triad's quick-change coupler.